A Christian group is calling on the Australian government to provide WASH access for 8.8 million people each year by increasing aid to water and sanitation from the current A$ 117 million (US$ 114 million) to A$ 500 million (US$ 487 million) per annum by 2015. Based on the estimated A$ 70 billion a year that is needed to meet the MDG targets for water and sanitation by 2015, the group believes that Australia’s fair share in this effort amounts to A$ 500 million per year. 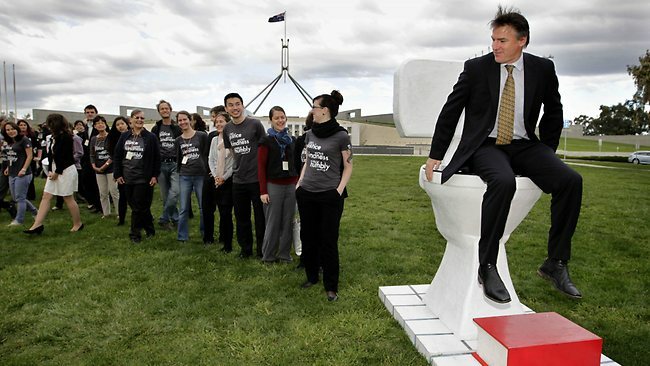 As part of their Micah Challenge campaign, the group set up a giant toilet outside Parliament House to draw attention to global poverty and the link between decent sanitation and preventable deaths. The link between access to sanitation and global deaths was clear, national coordinator John Beckett said, adding [that] about a quarter of the 8.1 million annual child deaths could be prevented. “That’s two million kids who could be saved,” he said. […] “No-one should be dying for a dunny”. ensure that WASH is appropriately integrated into aid programmes for health and education. Micah Challenge is a global campaign active in 46 countries to halve poverty by 2015 set up by the World Evangelical Alliance and the Micah network of the Christian relief and development agencies. For information read the WASHing Away Poverty report published by Micah Challenge Australia. This entry was posted in Campaigns and Events, East Asia & Pacific, Funding, Progress on Sanitation and tagged AusAID, Australia, finance, Micah Challenge. Bookmark the permalink.